American Red Cross Fire + Ice Gala draws record crowd at Saratoga City Center. The American Red Cross held its Fire + Ice Gala at the City Center. For the first time, the American Red Cross held its Fire + Ice Gala at the City Center, on March 22, and drew a record crowd of 420. An added bonus: three disaster relief vehicles could drive into the ballroom for guests to explore, said Gary Ferris, executive director of the Adirondack Saratoga Chapter, based in Glens Falls. One truck, from Albany, has 99,000 miles and went to New York City after 9/11, to Louisiana after Katrina, and to help victims of hurricanes Isaac and Sandy. “We provide food, we provide beverages, we provide hope,” Ferris said. And for the first time in its 16-year history, the Fire + Ice Gala benefitted both the Adirondack Saratoga and Northeastern New York Chapter, based in Albany. Founded more than a century ago, these two Red Cross chapters have 1,700 volunteers and cover 12 counties—from Greene and Schoharie to Hamilton and Essex—providing disaster relief and lifesaving services for 1.2 million people. Joining the two chapters at the Saratoga City Center drew 170 more people than last year’s gala in Troy. “Our net proceeds were over $82,000, which is almost double last year’s amount,” said Kara Livingston of the American Red Cross Northeastern New York Region, which last year responded to 339 local disasters, primarily house fires, affecting 643 families. The Red Cross also collected more than 80,000 units of blood for use at hospitals throughout the region. From Haiti to Sandy, disasters abroad and close to home never cease. Yono Purnomo, a chef and new board member, said he witnessed the devastation in his native Indonesia four months after the tsunami hit. “I’m here because I believe in the community efforts. Seven years ago, the tsunami in my country, I lost my whole family, the whole village died….” Chef Yono and his wife Donna Purnomo donated dinner for eight at their restaurant—one of four live auction items—which raised about $1,750 for Red Cross disaster relief. Spirited bidding for a behind-thescenes tour of the World Trade Center by developer Roger Silverstein, followed by lunch, raised $5,000. High bidder was Marissa Valletta. Patty Valletta, Marissa’s mom, and Lisa Scott co-chaired the gala, which featured filet mignon and crab cake by Mazzone Hospitality and the great vocalists and brass section of New York Players. Honorary chairs were Chris Dowd, president and CEO of Ballston Spa National Bank; his wife, Patricia Putman; and Dr. John Bennett, president and CEO of CDPHP. Mary Fran Faso, a Red Cross board member, was accompanied by her husband, John Faso, who ran for governor in 2006 (losing to Eliot Spitzer), their daughter Margaret, son Nick and his wife, Meagan Murphy. When asked if he had any plans to run again, John Faso said: “I’m a recovering politician.” Chatting with them were Candace and Charles Wait, there with Natalie and Charles Wait Jr., the father and son at the helm at Adirondack Trust Co.
Mike Tripodi, a volunteer mass care supervisor, gave a mini-tour of one of the Red Cross disaster trucks that could serve 1,000 meals. Richard Sleasman of CBRE, board chair for the Albany chapter, thanked Mona Golub of Price Chopper for raising more than $2 million for disaster relief. Rob Albano of Barton International, Adirondack Saratoga board chair, and regional CEO Gary Striar also addressed the crowd. 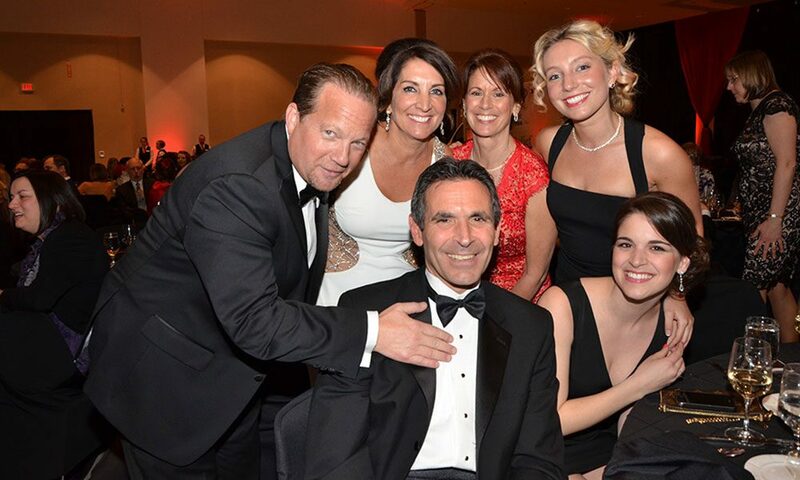 Gala-goers included Laura Petrovic of the BBL Family of Companies, which include Saratoga’s Marriott Courtyard and Residence Inn; Roger and Joyce Locks of Hatsational; Kate Otis of Key Bank; and Leah Slocum of Realty USA. Tom and Sara Griffen of Albany, Tim and Catherine McCann of Loudonville, Lori Anne and Jim Harris of Clifton Park, and Carrie Hillebrand, Sujata Chaudry, and Rebecca Burnham were also there to have fun—and support a good cause.